Summer time is known for good times, easy living gloriously long lit days. But as with every good thing, along comes it's flaws. There are many summer bummers that can be easily avoided in order to have a more pleasant summer. Here are just two of the most dangerous summer bummers. It's always a great idea to watch and protect your skin while out in the powerful UV rays. By the time the sun hits your skin, it will have traveled for eight "light minutes", even so the rays still have the power to break the elastic bands in your skin's collagen turning it into what looks like, through a microscope, scar tissue and to the naked eye, it looks like hell. UV rays exist in three-forms; UVA, UVB, and UVC. UVA has a long wavelength which allows to escape through clouds and haze. UVB rays have a shorter wavelength and a more powerful punch. UVC rays have such a short wavelength that it can't get past the ozone layer to reach us. UVB is what causes sunburns, this is a fact and what keeps sunscreen-industrys still in business. Always wearing your sunscreen allows us to stay out in the sun much longer without burning. Another scary summer bummer is drowning. This is not, at all, a pleasant way to go, as we all should know. Researches have found that there are four different ways to drowning. First is "dry drowning", this is when a person's submerged larynx goes into spasms, closing off the windpipe. In this case death is caused by suffocation and no water is actually ever entered into the lungs. Then there is "wet drowning", which actually has two types. Number one can happen in the ocean when the salt water flows in to the lungs and because of osmosis, takes fluids from the body itself, when in the end makes the person drown in their own fluids. Number two happens in fresh water. The liquid is absorbed into the bloodstream from the lungs which causes blood cells to swell and burst which will eventually cause ventricular fibrillation and death. 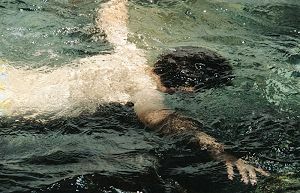 The forth form is known as "secondary drowning". This happens when someone has been miraculously saved after a near-drowning and is sent home only to die with in 96 hours. This happens because of aspiration pneumonia brought on by bacteria and microbes in the water that filled the lungs. Always remember that no matter how great of a swimmer you are, no one is as powerful as the ocean, and also its a good idea to keep that old rule in mind about swimming with a buddy, they can save your life.